Acme Cabinet Doors Now Offers Pre-Primed Cabinet Doors and Pre-Painted Cabinet Doors. 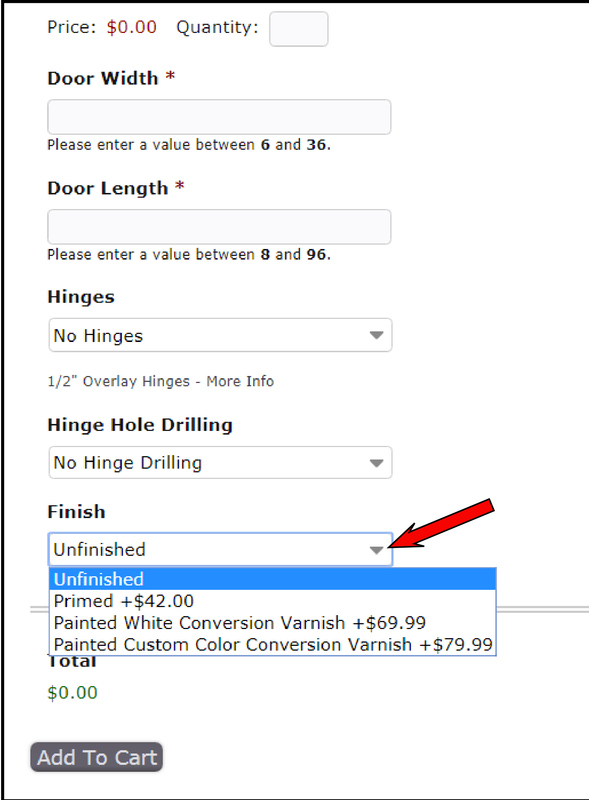 Speed up your project time by ordering your cabinet doors pre-painted. Our multi step factory applied Conversion Varnish finishes are extremely durable even under the harshest conditions. ​Every cabinet door we offer is available Primed or Pre-Painted matched to any paint manufacturers color code. Pre-primed Kitchen Cabinet Doors: What Does It Mean? What does the term, ‘pre-primed kitchen cabinet doors’ actually mean? This may not be a term that you are too familiar with, but in actual fact it is a type of cabinet door that opens up a whole world of possibilities and options. By buying this type of door it will allow you to alter the way your kitchen looks with relatively minimal effort on your part, so surely that is going to be a good thing? What is actually meant by this term is that the door you buy is virtually ready for you hanging on your cabinet apart from one important part. It is up to you to finish the door off as you see fit and with whatever paint or stain you wish to use. Basically, when you buy this door it is perfectly primed to easily allow the top coat to be applied just the once, although it depends on how well you paint it, before the door can be hung. This allows you to put your own particular finishing touches to the doors rather than trying to do the entire thing yourself, and making a mess of it, or being stuck with a pre-designed door that may not be right for you. It is important to point out that these doors will cover a range of budgets from cheap low cost doors with a poorer quality wood up to those that are more solid and expensive such as a rare type of mahogany, so there really is something there for everybody. It is entirely up to you to spend the time looking through the various options and choosing the type of wood or style of door you are after, but if you are stuck do ask the supplier for advice and they will be more than happy to advise you. One point that has to be mentioned is that most of the pre-primed kitchen cabinet doors that are available will tend to be primed on all sides leaving you with the surface that faces to complete yourself. It does mean that the rest of the door is going to be sealed correctly and it will be ready for hanging as soon as you finish the surface. How you then paint it or finish it is up to you, but do draw inspiration from the rest of your kitchen before finally settling on a color or the material that you will actually use. Pre-primed kitchen cabinet doors are, therefore, doors where all of the hard work is done for you with regards to preparing the door for being painted by yourself. It allows you to feel as if you have contributed to the entire project rather than simply hanging the doors, but thanks to knowing that the doors have been made ready for you it does mean that you can focus entirely on producing the best finish possible and to have cabinet doors that you will ultimately be proud of. By buying pre-painted cabinet doors you are going to immediately save yourself some effort and money as well as quickly getting the finished look that you were hoping for before you started your renovation project. Painting doors, and doing a good job of it, is not only laborious, but it is also a difficult job thanks to there being the tendency for streaking, uneven coverage, and basically just the door not looking as good as it should. Thanks to purchasing doors that have already been painted you can instantly see how it can save you a lot of problems from the outset. To begin with, it is important to remember that there are so many options out there when it comes to the different finishes. You only have to think about the range of colors in those charts as well as types of finishes such as the paint having a crackled glaze, a glossy finish, or a more matt look. What all of this builds up to is you having more options available than you were perhaps aware of, but surely this is a good thing? Apart from the options available you also need to think carefully about the actual painting process from start to finish to see why buying doors that are pre-painted really does make perfect sense. In order to do it yourself you need to sand down the door, smooth it out, use an undercoat to prime it, and then several top coats just to get that polished look. Think about all of the time you need to spend doing this and then think about all of the equipment and materials you need to finish the job and you will see how this really is the better option. Next, you need to think about how good you are at painting because the last thing you want is to have cabinet doors where you can see the brush strokes because they really will catch the eye and it will certainly make you start to hate your cabinets. Instead, get them pre-painted by professionals to get that polished look where you cannot see any marks resulting in a door that just oozes quality rather than a Sunday DIY project that has not worked out as well as it should have done. Finally it is worthwhile talking more about the cost. These pre-painted doors do not have to be expensive and indeed you only have to think about the expense of the different paint you need and do you really need the hassle of trying to do it all yourself? Weigh up the cost to you for that DIY job and then look at the price of the doors themselves and do remember that they will vary in price depending on what you need, so think carefully about your budget. By going ahead and purchasing pre-painted cabinet doors you are going to prevent yourself from developing a headache thanks to trying to paint doors to the same high standard yourself. Look at the various options, think carefully about what fits with the style and look of your kitchen, and go ahead and buy them. Changing the look of your kitchen really cannot be any easier than this.